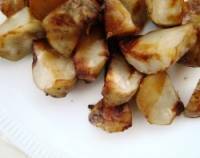 Sunchokes, also known as Jerusalem Artichokes, are an excellent substitute for potatoes and a good source of inulin and vitamin C. They make a great vegetable for Kapha constitutions as an alternative to heavier root veggies but are best for Vata and Pitta. Their source of inulin, is more easily digested by diabetics and provides fiber. Sunchokes are in season from Oct-April so catch ’em quick! Check out these websites for more info and easy recipes!